According to the best readers in the world (you all), there is a new pizzeria in NEPA that's making some noise. Shortly after it opened, I had several requests for a review roll in through my suggestion box so I knew I had to get to Uncle Joe's soon! I'm not in Pittston very often, but everyone told me it was by the new Walmart so even my directionally deficient self was able to find the place at the corner of the new strip mall very easily. I should note that I was pulling in at any pizzeria's busiest time - 5:30 on a Friday night, and I was in a hurry so I wasn't sure if Uncle Joe's would even be able to serve me due to my own time constraints. I walked in the door to find a couple of gigantic 24" pizzas for cuts or "slice pies" as we call them in the business. Right out of the shoot, I recognized the pizzas as the largest in NEPA. I've seen gimmicky boardwalk pizzas that size at the Jersey Shore, but never a pie that large in this area! Coincidentally, I've never had a really good pizza that was huge as pizzas this size typically sacrifice quantity for quality. I identified the hot wing pizza slice as the freshest of the batch, and the very friendly girl working the counter quickly took my order. As I waited for my slice to reheat, I sat in awe looking at the operation they were running. There had to be at least 10 people in a small kitchen area, and everybody was working really hard and helping each other out. I was totally impressed when a delivery driver made sure I was taken care of at the counter, then another cashier jumped in to take my cash, and even the pizza maker asked how I was doing. I determined that whoever Uncle Joe is, he must run a tight ship and people must enjoy working for him, because it was a really clean and well run operation. The dining area was relatively small, with probably 8 tables, and I wasn't sure if they offer table service, but it is very new, clean, comfortable, and modern. I wish I was not in such a hurry because I did enjoy the atmosphere, and I would have loved to see more of the operation. I scarfed down my slice noting that this was an excellent hot wing pizza with a ton of flavor, a little bit of heat but not too much, and a nice balance to the whole thing. 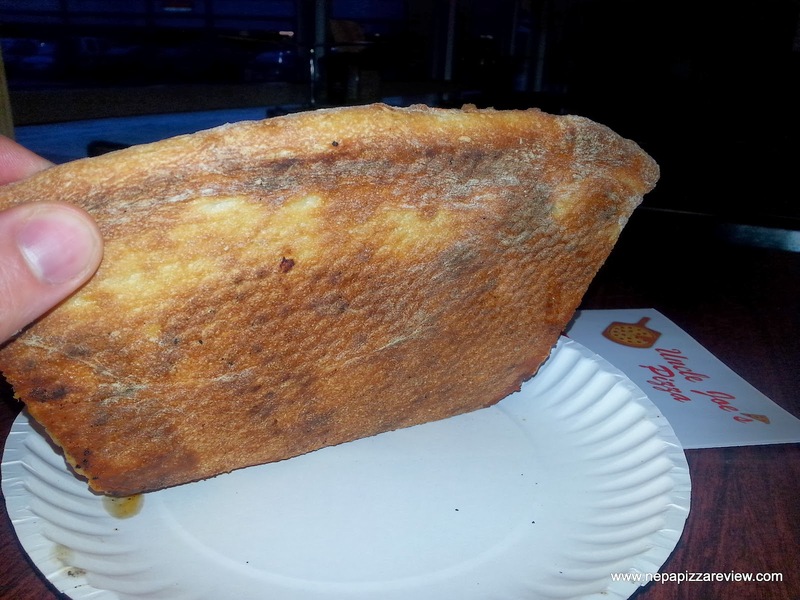 The thing that impressed me most was the fact that the crust was so incredibly tender, thin, and crispy, which is a feat in itself because the giant pizzas are cooked on screens, and typically huge dough is not easy to stretch so thin and consistently. I wish I had more time to savor this slice and surmise how they achieved creating such a huge pizza without sacrificing any quality, but I had to be on my way and get on to my other 2 Pittston pizza reviews and a birthday party (which was also serving pizza - yes that's 4 pizzerias I tried in one night - yes my system basically shut down). After pushing in my chair and tossing away my waste, another person who had not yet greeted me popped his head out and asked how the pizza was and I told him it was very good - and I meant it. I continued walking and one of the delivery drivers dropped what he was doing and rushed to open and hold the door for me! These all might seem like trivial things to people, but customer service is truly a lost art in many places and I feel it must be recognized whenever I see it. I would go so far to say that Uncle Joe's provided me the best service (at their busiest time) that I've had in a long time. I received all of this great service in a total time of about 7 minutes in the building. For that I must say thank you Uncle Joe! 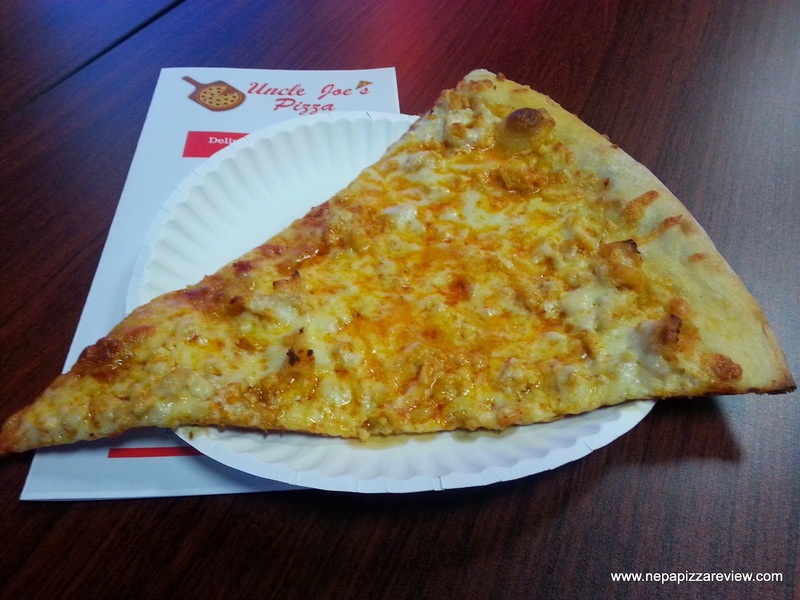 I also must recommend that the NEPA Nation get out and give this new pizzeria a try!